Delivering: Brand positioning, copywriting, event programming and production across several platforms to drive both retail and online sales for the rare book dealership. A.G. Geiger Fine Art Books and Press specializes in contemporary California artists and is a beacon for the Los Angeles art community. Hosting podcasts, forums, readings, music and performances, my bookstore is becoming an important magnet in the burgeoning Chinatown art scene. While posting regularly to Instagram as well as blogging reviews and community art news, I also program the store's events including the annual book fair in October. Now in its 3rd year, the fair continues to grow and will now includes music acts. Delivered: Concept, Art Direction, Executive Production, and Business Development. For no particular reason other then I thought it would be cool to buy my friends a drink when I couldn’t be there; I devised an app that enables friends to send each other money via Pay-Pal when their friends check into a bar or restaurant via Foursquare. Working with the magicians at Clockwork.com, we made “Schmoney”. I then contacted the producers of the Colbert Report to offer the app as a way to raise money for Mr. Colbert's Super-Pac. When Mr. Colbert checked in anywhere, Colbert "Heroes" would be alerted with a Colbert bon mot and be prompted to donate to his presidential super PAC. "Heroes" could choose denominations in increments of five and add "What they Stand For". To game-ify the promotion, we added the "Heroes Wall", a reward system similar to the badges earned in Foursquare. Delivered: Concept, Art Direction, Copywriting, Business Development. Finnegan’s Craft Brewery whose profits go to charity, sought new ways to engage their fan base and explore new technologies to execute on premise promotions for a new product launch. We modified the Schmoney platform to activate a promotion instead of expediting peer-to-peer gifting. When checking into a participating premise, the “Beer it Forward” app would push the promotional code to the user to show the bartender or server. Participating venues were immediately updated in a back-end feature. 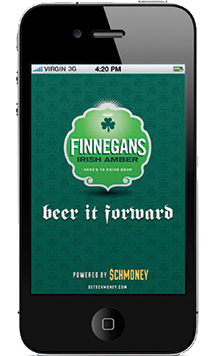 100% Finnegans Brewery profits go to the Minnesota Food Bank. Delivered: Original concept to activate and game-ify augmented reality app via packaging. Business Development secured Ab InBev's initial investment. AB InBev sought a unique way to support a statewide promotion of Michelob Golden Light. Although still the top selling beer in Minnesota, they saw marketshare slipping and wanted to bring the brand top of mind again. Targeting early tech adopters and hoping to create something that would generate strong word of mouth, I concepted an augmented reality game designed to reward the perfectly “smooth pour”, their tag line. AB InBev commissioned development of the app to be activated on MGD packaging but ultimately did not greenlight it for production. Later, under a different creative director, Modern Climate pitched Best Buy who took advantage of the AB InBev work and produced the 3D augmented reality promotion shown in the video.